F Alex Franklin, 6-5/226, Sr.
F Ryan Rossiter, 6-9/234, Jr.
F/G Edwin Ubiles, 6-6/204, Sr.
G Clarence Jackson, 6-3/185, Jr.
G Ronald Moore, 6-0/160, Sr.
F O.D. Anosike, 6-7/217, Fr. F Owen Wignot, 6-6/210, Soph. G Kyle Downey, 6-2/203, Soph. 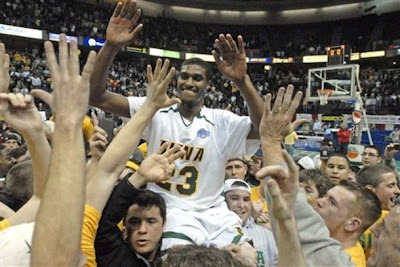 Siena March Madness 2010 profile: Siena is a trendy pick to beat Purdue due to Purdue's injury problems,however that game is going to be a dog fight as Purdue still has more talent even without Hummel. What you like about Siena is that they have all upperclassmen in the starting lineup and have gotten to the second round each of the last two years so they don't lack experience. In addition they have a top flight guard in Moore which is a key in March and Franklin was the MAAC player of the year. What might really do it for Siena is that they are disciplined committing the fewest fouls in the nation, and shoot way more free throws than their opponents making up for poor three point shooting. We have Siena loosing as Purdue is a veteran team as well with a lot to prove and a lot of talent, still don't be surprised if Siena pulls the upset.